So, you’re considering buying a caravan? This may have been something that you have been mulling over for a while, or perhaps you have recently discovered the joys of a caravanning holiday? 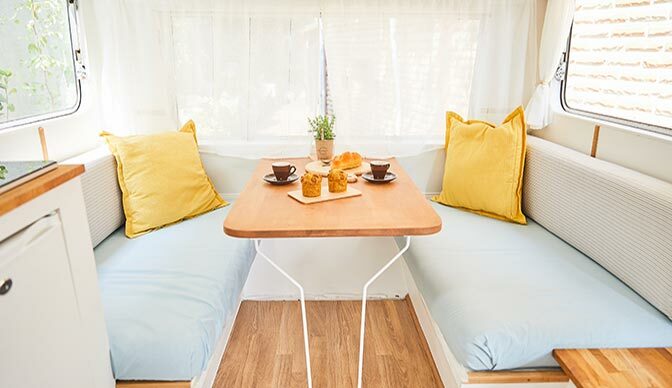 Maybe you have friends whose Instagram is filled with idyllic shots of the sunrise framed by their caravan window and you yearn for this simple type of holiday? Renting is a good place to start if you have decided that you may want to buy in the future. Ok, so now you’re sure that it will be worth the investment - where do you start? As with house-hunting, the viewing process may alter your idea of what it is that you thought you wanted. 1. Take your time: Make sure that you do your research in order to narrow down your requirements and create a shortlist of brands/models – so that you can choose the best shows to visit. To help plan your day, each event’s website will be showing the exhibitor information prior to the show. Finally, remember to check if all the models on your shortlist can be safely towed by your vehicle. 2. Choosing a show: The bigger the show, the more likely it is to attract overseas brands – so if you have your heart set on a model that isn’t made in the UK, then it is important to try and attend the larger caravan shows eg. The Caravan, Camping & Motorhome Show at the NEC in Birmingham. One reason that caravanners like to buy from a show is that there are often ‘freebies’ thrown in with the deal and some also offer ‘show only’ discounts on certain models. However, one of the best things about attending a caravan show is getting advice and inspiration from experts in the industry! 3. Comfort & Design: How much space do you need? Is having a good night’s sleep paramount? Or are you willing to forgo the luxury bed-space for a larger ‘living space’. Will the bed be too narrow? Is a fixed bed or fold-away bed better for your needs? Whatever you’re thinking – the best way to know for sure is to view the caravan and lie down on the bed! Can you (and others planning to use it) fit in the shower? It is also advisable to check the manufacturer’s attention to detail - by opening cupboard doors etc to check that they don’t knock into any other fittings. Is there anything you dislike about the fixtures and fittings that can’t be easily remedied? 4. Price Range: Here is usually where the biggest compromise is to be made. If like me, your list of requirements tends to direct you to the most expensive model - the next step is to split your list into ‘essential’ and ‘desirable’ sections and see what your budget can achieve. How will you be financing this? If you are planning a loan, there are often decent financial arrangements available at the shows. 5. Choosing a dealer: Once you have decided on your model, you will need to find a dealer – make sure that you speak to at least a couple of dealers and try to get a clear price. It is prudent to choose a dealer that is reasonably close to where you live - or at least not hundreds of miles away. This is important, in case there are any issues that need resolving under warranty in the future. To avoid being pressurised to make a purchase, try and visit the show early on its run – so that you can go away and consider the price for a day or two - while still having time remaining before the show finishes, to benefit from any special offers that end with it. -	The National Motorhome and Campervan Show. 26th-28th April 2019 at East of England Showground, Peterborough. -	The Southern Motorhome Show. 17th-19th May 2019 at Newbury Showground. -	The Midsummer Motorhome Show. 21st-23rd June at Stoneleigh Park, Warwickshire. -	The Norfolk Motorhome Show.19th-21st July at Norfolk Showground, Norwich. -	The Motorhome and Caravan Show 2019. October 2019 (TBC) at NEC, Birmingham.